Coffee is the most popular beverage. Apart from its flavour and fragrance, coffee makes one highly energetic. Therefore, it’s a wonderful idea to offer this beverage in your restaurant. With today’s fast paced lifestyle, most people are likely to request to have their coffee away from your premises. This requires planning for this beforehand. Apart from offering coffee cups, ensure to invest in carry cup trays for customers to take away their coffee conveniently and hassle free. Consider these 6 reasons why your restaurant needs coffee cup carry trays. There’s a growing concern for environmental protection all over the world today. Therefore, every business owner should incorporate green business strategies. 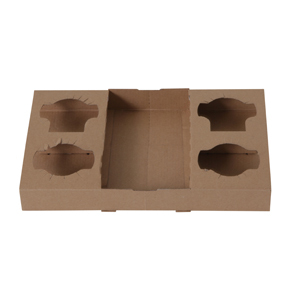 The good thing about coffee cup trays is that they are biodegradable, compostable, and recyclable. This makes them friendly to the environment and more appealing to customers who are conscious about green living. These are bound to begin flocking your restaurant in droves. Some customers just want to grab a snack and a hot cup of coffee before getting back to their work. Therefore, it would be very convenient to have their coffee cup on a tray. This would make it possible for the customer to carry their snack in one hand and their coffee cup tray in the other. Alternatively, the customer can just hold the tray and snack bag in one hand to leave the other free just in case. The best thing to make you buy coffee tray for your customers is to allow carrying four cups on the go. This is bound to enhance the customer experience in your restaurant. Additionally, the ability to support four cups on the go makes it possible for a customer to take some coffee for colleagues too. One or two can come and pick enough coffee cups on the trays for everyone. The tray is also helpful when you have to deliver coffee to more than one person in the same location. As noticed above, coffee carry trays support four cups. This is a great idea for people working in a team. A customer will find it easier to take some coffee to a colleague as well. Additionally, some customers take more coffee than others. It’s easier to take more than one coffee cup on a tray enough to take at their convenience. Your restaurant will benefit from more sales. Customers on the go want to come to your restaurant grab a hot cup of coffee and get back to their work. Perhaps they are to take some coffee to colleagues as well. Putting the customer’s coffee cups on a tray eliminates chances of spillage and injury in case of collision with another person on the way out. The tray keeps the coffee cups securely in place. It’s impossible to tell the kind of customers who come in to take some coffee. Some might be getting back into their cars to take a sip as they drive. For those without enough cup holders, a coffee tray is a convenient solution. When considering this niche market for your coffee, it’s a worthwhile investment to stock up some coffee trays. Customers prefer restaurants that give them a pleasant experience. Offering coffee trays is a wonderful idea to enhance your customer experience. Luckily, you can easily stock up some trays from a reliable restaurant supplies store at wholesale price.